Nazis. Zombies. Aliens. Orcs. Templars. Slave owners. Violent videogames dehumanize enemies to justify lead characters’ horrendous murder sprees. Action games need action, and eliminating waves of “bad guys” is the easiest way to manufacture causality for the player. Besides, who cares how many Nazis are shot? They’re evil; a comfortable moral judgment we all make, which leaves little room to dwell on the aftermath of the slaughter. Very few games force us to look at the opposite hand of evil present in all acts of killing, morally justified or not. In Freedom Cry, the first supplemental singleplayer narrative DLC for last year’s Assassin’s Creed IV, Ubisoft surprises by choosing to tell a tragic story about senseless death and the evil within human beings. It may not provide answers or solutions (or even, for that matter, effectively deal with the anger of its new protagonist), but this is perhaps the first AAA game in recent memory that gives context to one of humankind’s worst atrocities: slavery. Very few other games have tried to do the same. The Assassin’s Creed series has never shied from violent deaths in the name of a greater cause. The titular “creed” is the oft-quoted justification for revenge, sabotage and assassination. The war against clandestine Templar machinations provides the major narrative thrust from the first title up to the most-recent. But what’s been noticeably absent from each game is a more serious conversation about the actual, historically accurate darkness festering in the societies across which Desmond’s ancestors have parkoured. Poverty, religious persecution and racism have only made fleeting appearances, and all take a backseat to the dramatic recycling of “Templars vs. Assassins.” Such whitewashing of the past is a real shame for players uneducated on the more robust histories of great cities like Damascus, Venice and Constantinople. Freedom Cry fast forwards 15 years after the conclusion of Black Flag to see Adéwalé, Captain Kenway’s former quartermaster-turned-assassin, captaining his own ship and crew, at least for five minutes. His ship is destroyed in the introduction, which sets him off on a fight to free slaves in the Caribbean. Freedom Cry’s violence actually makes sense, for the most part. 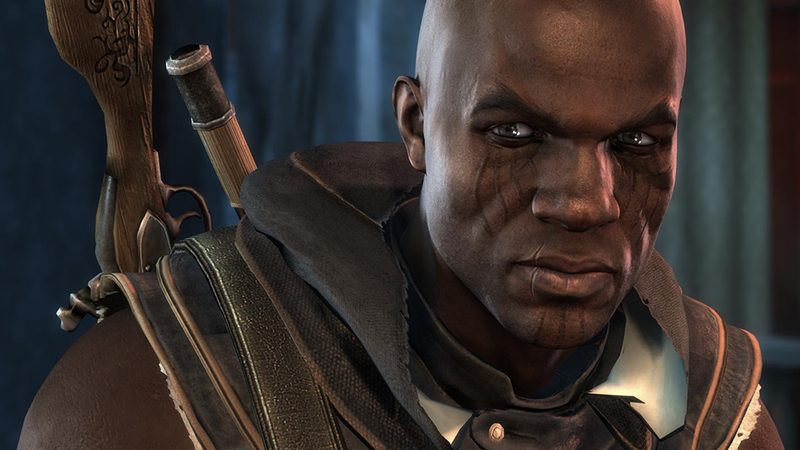 Adé, as his comrades affectionately refer to him, was born a slave and fought for his independence, eventually earning a larger role within the Assassin brotherhood. Now, lost and marooned on Port-au-Prince amidst the crushing industry of slave trading, he has a chance to make a major difference. Instead of killing nameless, faceless Nazis Templars for the sake of providing action, Adé slashes and slices under the banner of freedom. It’s a story anyone can get behind because it’s morally clean -- the vengeance is justified because of the nature of the crime. Throughout the four-hour campaign, Adé becomes the savior for hundreds of slaves so grossly dehumanized: beaten by French slavers, on the block for auction, locked in cells. More than any other Assassin’s Creed game, Freedom Cry does a fair job of prodding your sense of morality, and perhaps your guilt as, in my case, a white gamer. I found myself stalking countless plantation guards and slave traders to violently stab them without any remorse. It’s a complicated and rewarding feeling to kill others to end slavery in the West Indies. But Freedom Cry has a huge problem: Its structure can’t adequately deal with the themes and challenges of slave history outside of a very basic understanding and simplistic sense of right and wrong. The stab-happy philosophy of Assassin’s Creed is almost childish in how Adéwalé chooses to resolve the slavery around him. It’s disappointing to see such a strong black male protagonist resort, more often than not, to blind rage. Quentin Tarantino handled the transition from prisoner to avenger with a far deeper complexity and sensitivity, even with all the gore, in Django Unchained. Adéwalé is a black character in a largely white franchise (all things considered). He’s a hero, a focused-yet-flawed individual with a sense of purpose and duty -- the antithesis of Edward Kenway. Personally, I'd rather see a follow-up to Black Flag starring Adéwalé . Perhaps the most glaring error within the DLC is how it makes a commodity of the very human souls Adéwalé seeks to free. 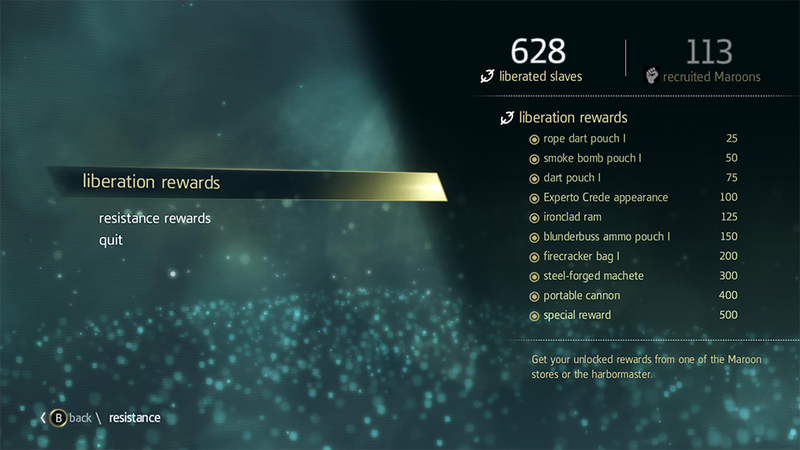 Full disclosure here: I never played Assassin’s Creed III: Liberation, which had some similar overtones in how it dealt with slavery. If it treated the subject matter the same, or worse, I don’t know. But in Freedom Cry, freed slaves are used as a way to unlock gear upgrades. The more you free, the better unlocks you’ll get, which is unsettling. It’s very difficult to ignore such an oversight. What’s most unfortunate about this mechanic is, once you’ve unlocked all the upgrades, there’s absolutely no progression-based reason to keep freeing slaves! Aside from your own invented obligation to free every generated slave that pops up, the game never incentivizes the time invested when the upgrades have dried up. It’s terrible! When the cry of freedom is the narrative crux of the story, it shouldn’t have an artificial cap in place. At the very least Ubisoft could have implemented some sort of faction or NPC influence meter, akin to the honor system in Red Dead Redemption, which might provide persistent “goodwill” for Adéwalé the more he maintains his crusade. Perhaps the most glaring error within the DLC is how it makes a commodity of the very human souls Adéwalé seeks to free. Anyone can keep endlessly liberating the game’s randomly generated slaves. However, there’s no logical reason to keep doing it. By the third act I was ignoring the screams of a runaway slave being chased by a jailer. The game pops up with a temporary quest marker telling you to take care of it, but as these events happen every minute or two while in-town, the horror wears off by the second hour. The repetitious nature of Assassin’s Creed minigames is a bit offensive here. Slavery is a bold topic for games. I applaud Ubisoft’s decision to expand on something so horribly integral to life in the 18th century West Indies. Freedom Cry needed to be made, to show the industry that other taboos can be brought into the mainstream. Yet the game fails to address the glaring insensitivity of turning slaves into a digital commodity. The intentions are solid, but I can’t get over being told that slaves, already treated as property, are further degraded into some kind of sub-commodity to help make your smoke bombs better. When the game tells you that you need to free 100 more slaves to upgrade your machete, you know the point was missed somewhere in there. Freedom Cry is set in one of the darkest periods of human history, but it only skims the surface of the deeply tragic past. We all know slavery was wrong, and that’s as far as Freedom Cry takes us morally: free enslaved people, get better weapons because of it. Assassin's Creed fans disappointed by the last few protagonists. Those happy with Black Flag but felt the game was lacking in diversity. Someone with moral issues about Ubisoft's bumbling of the subject matter. Assassin's Creed IV: Black Flag -- Freedom Cry was developed by Ubisoft Montreal and published by Ubisoft. The DLC is available for individual purchase for a suggested retail price of $9.99, or as part of a Season Pass for $19.99. It is available on PlayStation 3, PlayStation 4, Windows, Xbox 360 and Xbox One. The reviewer received the game as part of the Season Pass and played it to completion on Windows before writing this review. Please see our review policy.